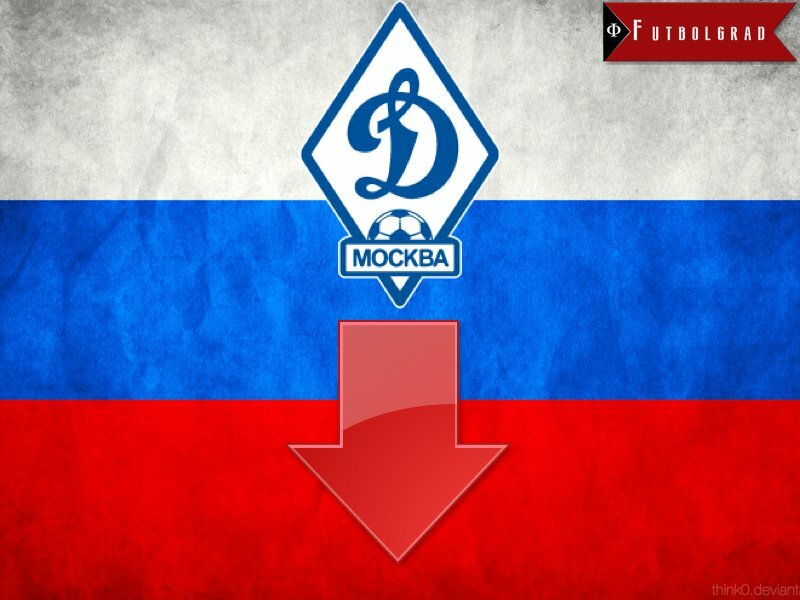 In the end no miracle occurred and Dinamo Moscow were unable to fight off their first ever relegation, as the club lost 3-0 to Zenit Saint Petersburg. Yet Dinamo’s recent form, several injuries, as well as the fact that city rival Spartak were always unlikely to help Dinamo out by beating FC Ufa—Spartak ended up losing 3-1—meant that relegation was almost unavoidable. For Dinamo Moscow the relegation concludes an unfortunate season that begun with the club being banned by UEFA from participating in the Europa League due to irregularities in the clubs finances, and continued with a financial restructuring that saw the departure of several key players, as well as successful coach Stanislav Cherchesov—he has since won the Polish championship with Legia Warsaw. The club’s two remaining stars Aleksandr Kokorin and Yuri Zhirkov were then sold to Zenit Saint Petersburg in the winter, and as fate would have it Kokorin scored Zenit’s second goal in the 3-0 win over Dinamo on Saturday at Arena Khimki. The Russian striker refused to celebrate the goal that saw his former club relegated to the Football National League, but the damage was done nonetheless. Yet Kokorin is hardly to blame, as the entire season has been overshadowed by mismanagement, and financial chaos—not exactly an environment that breeds success on the pitch. The timing for the relegation couldn’t have been worse either. Just a few weeks ago the club signed a deal with Jorge Mendes’ player agency GestiFute. Although the deal was not without controversy, the GestiFute deal was supposed to bring some financial stability to the club and allow Dinamo to sign promising talent for the new season. With Dinamo Moscow relegated, however, makes it unlikely that Mendes will continue the cooperation agreement with the club. In terms of infrastructure things were also going Dinamo’s way, as the club was supposed to move into the refurbished Dinamo Stadium in Petrovsky Park in early 2017. But instead of a home opener against a prestigious league rival in the Russian Football Premier League, Dinamo will now have to open the stadium against a team from the province—of course there is always the chance of inviting a prestigious opponent for a friendly, but that is beside the point. Indeed it will be interesting to see how Dinamo fans will cope with life in the Football National League. Some examples from other leagues show that relegation can spark fan interest, as all of a sudden there is a belief that a club, and its fans, need to stand together to get back to the big league. There are countless examples of this around the world, as Newcastle United in England, 1. FC Kaiserslautern in Germany, or even Spartak Moscow in Russia have all experienced this. Time of course will tell whether the tough path to the second division will bring the necessary reforms to Dinamo or whether the club will now completely fall apart, as was the case with Dinamo’s city rival Torpedo Moscow.